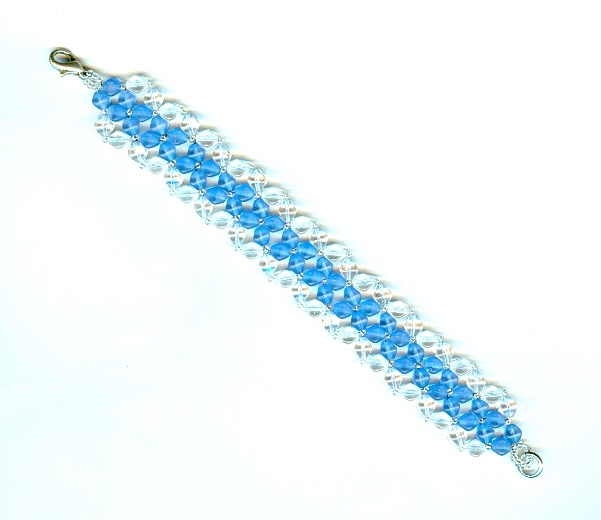 This versatile beauty is made with crystal clear and frosty matte light sapphire Czech glass bicone beads, needlewoven together for maximum flexibility. The colours are reminiscent of the sky on a May morning. The bracelet is about 3/4 in. wide by 7-1/4 inches long. It closes with a silver clad lobsterclaw. The bracelet has been adapted from a pattern originally designed by the talented Deborah Roberti, and published on the Bead Patterns website. It's lovely, it's elegant, and it's priced to own or to give.